The Crystal Goblin is the first volume in what I hope will be a series of books set in a fictional world populated by fantastic creatures. "When Lora, a headstrong elf-child, slips away from the orphanage, little does she dream it will lead to a series of grand adventures. Along with Sticky the imp, a slave seeking asylum in the Elven Realm, she journeys into enemy troll territory. Here they meet a troll outlander named Gnorr, whom Lora grows to love as the father she never knew. But convincing the elves of Gnorr's peaceful intentions will not prove easy. "As the three of them strive to make a place for themselves in the quiet elven village of Gwyn-Elm, knowledge of a magical artefact, The Crystal Goblin, comes to light. Its influence over their lives runs deeper than they can imagine, drawing them into a conflict far greater than their personal struggles. This first volume of Tales of Elves and Trolls comprises nine stories for all ages which can be enjoyed on their own or read together as a whole. Join Lora and her friends as they encounter sentient trees, a deadly dragon, and mischievous goblins; search for faeries, and try to prevent a battle that could change the face of their world…"
Fantasy fiction for all ages (recommended 9 years and up). Adventure, humour, and action. Read an excerpt Tale II: To Go In Search of Trolls. This tale introduces the main character, Lora. Pronunciation Guide Learn how to pronounce the Elvish names and words used in the book. Reader Reviews Check out what readers are saying about The Crystal Goblin, and submit your own reviews. Book Reviews & Interviews Reviews and interviews by dedicated book reviewers. Connectivity Links to book and author pages on social network sites such as Goodreads and FaceBook. Book Promos Audio/Video book promos. Includes embed code and downloadable mp3s for inclusion in blogs or podcasts. Click here for the embed code for this video and a downloadable mp3 for podcasting! The first edition trade paperback of The Crystal Goblin (limited to 500 copies) is available direct from the publisher (me) for $15 CDN plus shipping. Please contact me with your details for a shipping quote. You can, if you wish, have your copy signed and/or personalised (free of charge). - International Surface mail has been known to take 30 to 45 days. - At present I can only accept PayPal or International (Postal) Money Order*. *Canadian customers may pay by personal cheque (please allow 1 week for cheques to clear). 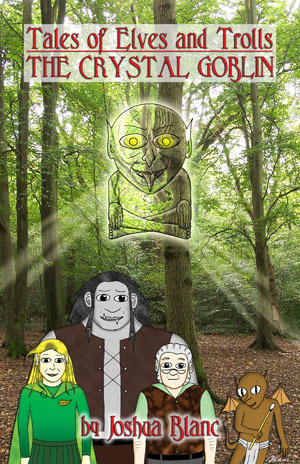 The Crystal Goblin is available as an eBook in the format of your choice (.PDF, .MOBI, and .EPUB).